You may be wondering, hasn't Mazda already facelifted the Mazda6? Well, yes, it has, and not just once either. This third generation Mazda6 was launched all the way back in 2013. 2015 saw the first facelift, adding LED lights, a new infotainment system and a Sport mode. 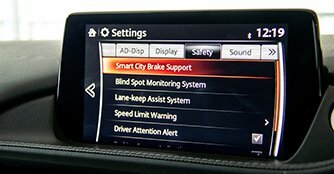 In 2017, Mazda updated the car further, adding G-Vectoring Control and more safety features. So, this car you see here is a facelift of a facelift of a facelift, if that even makes any sense. What's the point? 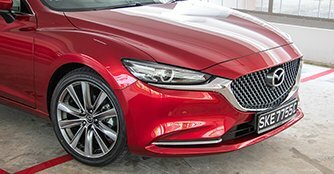 Well, on top of cosmetic changes, Mazda has delivered additional equipment and functionality to improve the overall refinement and desirability of the Mazda6. Yes, the most notable change is at the front - the horizontal grille from past iterations makes way for a larger front grille flanked by slimmer lights, drawing inspiration from the Vision Coupe Concept. 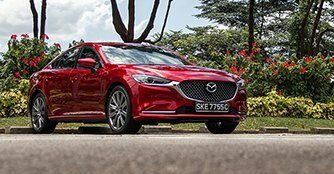 It further accentuates what is already an extremely stylish and good-looking car - with it's curvy lines, sleek dimensions and flowing creases, the Mazda6 looks much more expensive than its actual price tag of $139,800 (as of 28thAugust). And how about the interior? Well, there are a few changes to the cabin, too. 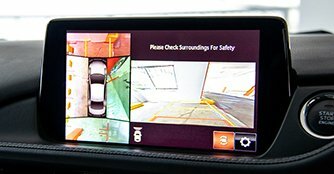 The infotainment system has grown from 7.0-inches to 8.0-inches, from which you can access a new 360-degree parking camera. There's also additional wood, acrylic and aluminium trimming across the dashboard and doors. In this particular trim, you also get a digital central instrument cluster. 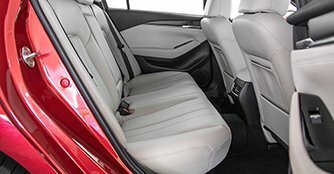 The front seats are also ventilated, drawing hot air away from your body. The interior is very pleasant indeed. It feels spacious and airy, helped by the white interior colour and sunroof. Materials are soft to the touch at places you will regularly be in contact with, although there are some other bits that don't feel quite as nice, such as the faux-Alcantara trimming on the dash. Yes there are. The Mazda6 is motivated by a naturally aspirated 2.5-litre engine, but power has been mildly bumped up by 3bhp and 2Nm of torque, now delivering 192bhp and 258Nm of torque. The engine now features cylinder deactivation technology, promising improved fuel economy. On the go, the engine feels more refined than before. Driven lightly, it's quiet and unintrusive, accelerating in creamy smooth fashion. Step on the gas and the revs climb, matched by a surprisingly pleasing sound. And the car isn't slow, either. 0-100km/h takes 8.4 seconds, completed in a refined manner. Turn into a few corners and Mazda's penchant for making sporty-driving automobiles becomes clear. This is no sports car, but for a large family sedan, the Mazda6 acquits itself well with bendy tarmac. Steering is accurate, and the car feels sure-footed at all times. Yes, it certainly is. All those changes add up to a car that feels more comfortable, more refined and more premium than before. 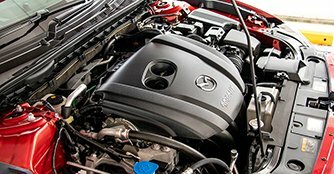 The constant refinement and improvement of Mazda's proven formula has produced a product that feels much more premium and mature than it's price tag would suggest. Yes, this particular 2.5 Luxury variant we drove is the most expensive one of the lot, and even though that isn't cheap by any stretch of the imagination, you're still getting quite a lot of car for your money. Premium looks, premium-feeling cabin, premium-feeling drive. Mazda clearly knows what it's doing.